UCA Executive Chairman Shamsh Kassim-Lakha delivers opening remarks at the inauguration ceremony of the UCA Naryn Campus. SALAMATSYZDARBY URMATTUU AYIMDAR JANA MYRZALAR! (Hello dear ladies and gentlemen). BORBORDUK AZIA UNIVERSITETININ NARYN CAMPUSUNUN SALTANATTUU ACHYLYSH AZEMINE KOSH KELINIZDER! Our Faculty, students and Staff of the University. Asalaam a lakum and good morning. Welcome to this historic event marking the inauguration of the first residential campus of the University of Central Asia’s School of Arts and Sciences. For this auspicious day we owe immense gratitude to several constituencies of the University. Foremost among them are the Founders of this Institution, its Patrons, the Presidents of the Kyrgyz Republic, Kazakhstan, Tajikistan, and His Highness the Aga Khan, 49th Imam of the Ismaili Muslims who is the Chancellor of the University of Central Asia. Their vision of this private, not for profit, secular institution, and their guidance and support, have been fundamental to the progress as a regional university that serves the development needs of the mountain societies of the Founding States and beyond. Permit me to also acknowledge the intellectual contribution and hard work of UCA’s Board Executive Committee; the University’s Construction, Academic, and Operations teams; the contribution of over 100 Time and Knowledge Volunteers from the Ismaili community globally who have given selflessly of their time and professional knowledge; and of course the generosity of our esteemed donors. We recognise today architect Arata Isozaki of Japan, whose magnificent designs for the campus here in Naryn as well as in Tajikistan Khorog, and Kazakhstan Tekeli have given us the pleasure of being in this surrounding. This design has been executed meticulously by the many consultants as well as the 600 workers and contractors, most of them from Naryn and from the country of Kyrgyzstan. Today, our special thanks go to the unwavering support of the Patron of the University, His Excellency President Almazbek Atambayev and the government of the Kyrgyz Republic. As well, the Governor of Naryn Oblast and the Mayor of Naryn and all their colleagues who have facilitated the University's construction and have so warmly adopted UCA as a part of their own community. Today in its operational state, this campus has trained and provided full-time employment to members of the Naryn community. The University's future growth will also offer important opportunities for local enterprise and employment. UCA’s effort and opportunities are regional. The construction of its residential campus in Khorog, Tajikistan is on schedule and I am happy to say will admit students inshallah in September of next year; and the Campus in Tekeli, Kazakhstan is expected to be open a few years later, possibly in 2019. 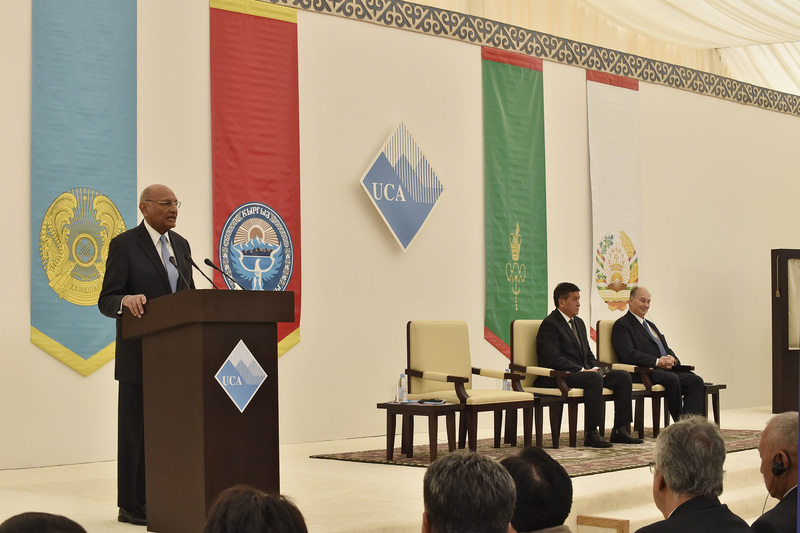 Today marks the completion of the first of four phases of the long-term development of the University of Central Asia. Many people have asked how we managed to establish this largest social sector project here in this mountainous terrain and in some difficult conditions, and in the remote mountain town of Naryn. We have done so by taking one deliberate step at a time: The University first of all has assembled experts from many countries while at the same time systematically training professional talent that is existing here in Kyrgyzstan and in other parts of Central Asia and we expect the nationals to take on bigger responsibilities. This reflects our unique model of a regional university, rooted in its context while benefiting from the best knowledge sources around the globe. Among these sources of knowledge is our sister institution the Aga Khan University, which has campuses and programs in several countries of Asia, Africa and in London, United Kingdom and from whom which UCA has received valuable support in developing many of our academic and administrative systems. Let me explain some other features that distinguish this University of Central Asia. To begin with UCA is the first institution in Central Asia that has a ‘commitment to development’ as a core objective. It is also the first regional university with all three campuses located in secondary towns. Its academic programmes are offering faculty and students opportunities to move between campuses. Specialisations here in Naryn will be for bachelor’s degrees in Computer Sciences and Media and Communications, and the Khorog campus we will offer Economics and Earth and Environment Sciences. And in Tekeli, Kazakhstan UCA will offer degrees in Business Management and Engineering. UCA is organised in three separate Schools. In addition to the undergraduate School of Arts and Sciences, which we are here to inaugurate today, there are the School of Professional and Continuing Education and the Graduate School of Development. The School of Professional and Continuing Education, since 2006 has trained 90,000 learners. Our Graduate School of Development is engaged in research in all three Founding States on relevant themes through its Mountain Societies Research Institute, the Institute of Public Policy and Administration and the Cultural Heritage and Humanities Unit. Besides our firm and thriving partnership with Seneca College of Canada, UCA is forging linkages around curriculum development with several renowned universities in Russia, in Europe, in North America, and Australia. Our student body and faculty also make us unique. Half of our faculty members come from countries of Central Asia and the remainder from four other nations. All were recruited on merit. UCA’s first cohort of 71 students was selected all of whom are present here today were selected from a pool of 600 students, or applicants on the basis of academic merit and leadership qualities. They are from the three Founding States, as well as Afghanistan and Pakistan. 40% are women; 56% are from rural areas and secondary towns – this was one of the most pleasant surprises we had as an outcome of our admissions process. This achievement however comes at a cost. While the cost of educating each student at UCA is US dollars $ 32,000 per year, tuition fees and living expenses are kept at $8000. However, thanks to the substantial financial aid through the generosity of His Highness and other donors, based on their financial circumstances, on average, students pay $1,450 per year in their national currency they don’t pay in US dollars. This cost as many of you already know is equivalent to many good secondary schools in Central Asia. And because UCA brings together students from different backgrounds, they gain an appreciation of pluralism and its power to teach understanding of different cultures and to breakdown hurtful stereotypes. Finally, while today’s Inauguration marks the end of the difficult journey of constructing this campus, it is also the start of a new and more challenging voyage; that voyage is to develop and sustain an institution not just build its buildings, with the right values and culture. As His Highness has pointed out, developing a high quality university is not like “instant coffee that you pour hot water and stir”. You need much more hard work. With your prayers, good wishes and support it is only together that we will realise this hugely demanding objective of taking UCA to its next stage of development.